Cathay Pacific have a full free onboard bar. There is no charge for any onboard drinks on Cathay Pacific, and the crew are generally willing to top you up, although service can be decidedly tardy at times. Wine, beer and spirits, are free. 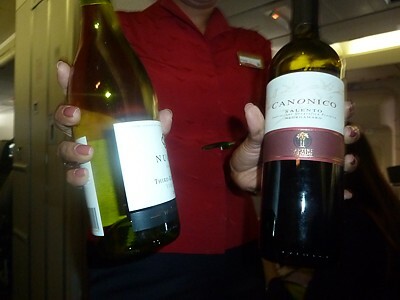 All wine in economy is poured from normal sized bottles. On the back of the menu cards, there is a list of the drinks available at the inflight bar. This menu will always list two different types of red and white wine, however there will only be one type on the trolley - and it is invariably the cheap one. Don't make the mistake of asking for the other option when the trolley is doing the rounds: the crew will invariably offer to bring it when they've finished the round, and about an hour later, your wine will turn up. Instead, just grab whatever is on offer, and then when the crew are just finishing the serving, press the call button and ask for the other type. They will then open a bottle specially for you. 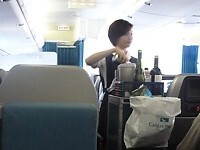 The only exception is if you are a oneWorld Emerald, in which case the senior steward will come up to you and greet you by name during the meal service: in this case, ask them for the decent wine; occasionally they will get something from the premium classes for you. This has a clean, light pale-straw colour. Taste-wise it has a bit of apple, and some fresh melon. One of the least understood, and least respected of the wine designations, it has a lovely tension between sweetness and acidity that mades it taste as if it were dry. The Nugan Estate 3rd Generation Verdelho has a pale straw colur with youthful green highlights. It has zesty tropical aromas with citrus overtones, fresh tropical fruit flavours with clean, zesty acids and a crisp, dry finish. The silky palate oozes flavours of sweet blackberry and onions. This is an unusual blend to be savoured. the intense ruby red colour is the result of controlled grape skins fermentation in horizontal rotary vats. It has an intense scent and slightly dry tannic taste. The Cantine Due Palme is obtained from selected Negroamaro grapes harvested in the second half of September, destemmed and vinified according to methods that guarantee a soft processing. 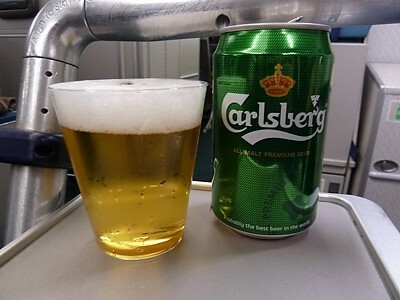 The wine completes its alcoholic fermentation at a temperature never exceeding 27� C.
The classic pale lager with a global distribution, Carlsberg has a refined and satisfying taste. Brewed to the original Danish recipe, it has deep malty notes and a distinct bitterness that generate a full flavoured beer. It is easy drinking at 38,000 feet. Incidentally, this is the brand marketed as Carlsberg Export in the UK, and is stronger (at 5%) than the normal UK Carlsberg lager which is brewed at 3.8% abv. The famous Dutch export Heineken, made of purified water, malted barley, hops, and yeast. It is the usual tame stuff you get on the ground, in a 275ml tin, brewed in the Heineken brewery in Zoeterwoude in the Netherlands. 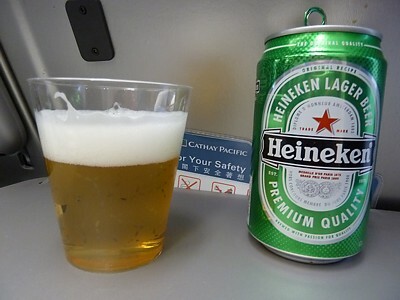 Oddly, this is the local Hong Kong beer on Cathay Pacific, and it's brewed on the island itself. For many HongKongites, it IS a local beer - which may come as a surprise for those used to drinking it on a Spanish beachside holiday. It's typical drinking lager, with little taste, but very refreshing. 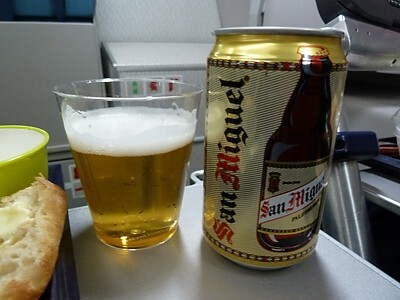 San Miguel Brewery Hong Kong is a well known brand in Hong Kong and has a 35% market share. It should be confused with the an Miguel brand in the United Kingdom, which is brewed by Scottish and Newcastle Brewing, who are now owned by Carlsberg. This is foul stuff, and is very much lowest of the low when it comes to beer. A fairly standard commercial lager rather than a bitter, and it is made using a wortstream brewing process, and uses a portion of cane sugar to thin out the body of the beer, which probably accounts for the decidedly aquired taste. It's slogan is VB - The Drinking Beer: which probably means you can drink it, but for anything else you'd be better off with something better. It is notorious for the ear-splitting hangover after a few inflight beers. 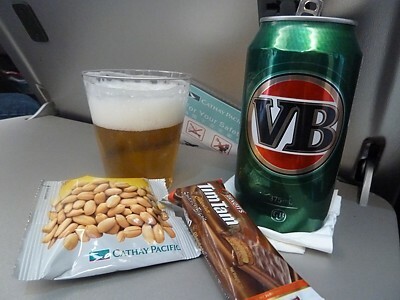 Incidentally, VB has the highest market share of all beer sold in Australia, and is brewed by Carlton & United, part of the Foster's group. A bit of a rarity this one. It comes all the way from the Castle Brewery in Johannesburg. 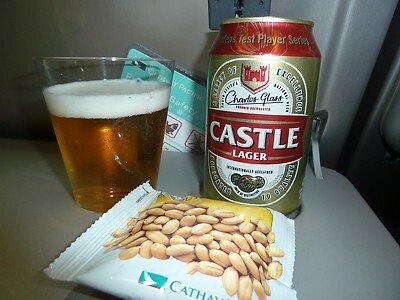 Castle Lager is a dry, bitter, pale lager that has won many awards, from gold medals to the "World's Best Bottled Lager" award. Pretty much my favourite on the few flights where I can get it, it is notable for not inducing the hangover of other inflight lagers. This a wacky one - the tonic is in the usual size can, but the gin is Gordon's.